Starting in the 1950s, the research of Len Webb and colleagues, from the Rainforest Ecology Section of the CSIRO Division of Plant Industry, identified the rainforests of northern Queensland as being the ancestral flora of the whole continent. They were unique, not merely the ‘rag-end’ of South-East Asian forests as had previously been surmised. Webb’s surveys found evidence for rainforest in 75 million year-old sediments across southern Australia long before Australia drifted close to Asia estimated to be about twelve million years ago. Under Webb’s patient scrutiny the northern forests were found to contain the world’s greatest concentration of primitive flowering plant families, suggesting Australia may have been part of the region where flowering plant families first developed. His work subsequently made crucial advances in the understanding and management of Australian rainforests. He was a key figure in the crusade to protect Australia’s rainforests as a non-renewable resource and heritage and frequently quoted from EJH Corner’s The Life of Plants to impress upon people the sheer magic of these ‘green cathedrals’. The above quote was one of Len Webb’s favourites. It encompassed the complex and, at times, inarticulate feelings he had about the teeming and tumultuous life of tropical rainforests. The 2 000 million hectares of tropical rainforest in the equatorial regions are located almost entirely within the developing countries of the world and are the home of more than 2 500 million people. Under the mounting population pressure in these countries, the fragile ecology of the rainforests is being subjected to increasing stress as they are cleared for food and timber and wood-chips. The disappearance and degeneration of the tropical rainforest, greatly accelerated by modern technological methods, are attracting international scientific concern – not only because of the inadequacy of many of the systems of land use replacing the forest, but also because of the irretrievable loss of world genetic resources and possibly detrimental effects on global climate. In this dawning crisis of the tropics, Australia is in an especially important position to study the intricate ecology of rainforests and pass on those findings to the rest of the world. The eastern Australian coastal region is, in fact, the only place in the world where the continuous variation of rainforests can be observed from the tropical humid and monsoonal zone to the subtropical and temperate zones, without the intervention of deserts. Australia’s rainforests are therefore an excellent and accessible laboratory in which to study the ecological processes involved in the distribution, development and regeneration of tropical vegetation. Australia’s tropical and monsoonal rainforests now cover less than half the area that existed before the first European settlers arrived and it is still diminishing with the assaults of logging, mining, clearing for agriculture and pasture, real-estate development and damage by tourists. Yet these forests are part of Australia’s heritage which must be preserved. Rainforest in northern Queensland is defined as tropical rainforest and is thus floristically more diverse and structurally more complex than it’s southern counterparts. The structure of a tropical rainforest consists of a number of vertical layers, including emergent trees reaching heights of 30 m. Little light reaches the forest floor, and many plants are epiphytes or vines, growing on the trunks of trees. The Australian Phytochemical Survey ran from 1946 until 1970. It was set up during the Second World War because of the need for new sources of essential drugs, vitamins and substances such as insect repellent. One of the early appointments to investigate alkaloids from Australian native plants and trees was a young chemist, Jerry Price who, 23 years later in 1969, would become Chairman of CSIRO. Another was Len Webb a botanist, who became one of Australia’s leading authorities on rainforests. Len Webb first worked as a clerk-typist for Government Botanist, Cyril White in the Herbarium of Brisbane’s old Botanic Gardens and from him learned of man’s deep involvement in nature. and a knowledge of Aboriginal bush medicine. But many plants were unknown hazards. While he was collecting bark of the ‘poison walnut’ on the Atherton Tableland he was smitten by nausea and swollen eyes and glands that lasted for days. Sap from the same plant squirted into Geoff Tracey’s eyes and he was in hospital for a week. By the early 1950s they had skimmed the cream of rainforest drug sources, proving them 10 times richer than other native vegetations. Organic chemists identified the structure of 500 alkaloids of which 200 were new. Not many had immediate application, but the survey swelled a valuable pool of information for further use. The first was mapping the broad diversity of rainforests over 30 degrees of latitude, from Cape York to Cape Otway, noting the effects of geography, climate, soil composition and fire. The second was the more detailed study of a particular area, the Moreton District in south-east Queensland, which they covered by foot and four-wheel drive. The third was the internal examination of the Whian Whian State Forest, in northern New South Wales, where they and Geoff Stirk of the CSIRO Division of Soils measured moisture, soil elements and plant types and came to grips with the sophisticated interactions of the rainforest. 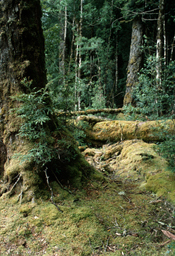 From this came their findings, which reversed the previous notion that climate was more important than soil for the growth of rainforest in eastern Australia, and provided the beginning of a system of forest classification. Working mostly in northern New South Wales and around Cairns, Webb and Tracey collected plant samples, seeking patterns in the seeming chaos of the rainforests. By the early 1960s they had gathered a vast quantity of data, intimidating in its complexity. Then Bill Williams, a former Professor of Botany at Southampton University with a background in computers, joined CSIRO. Webb asked for his help and immediately the study of rainforests took on a new and exciting dimension. Williams fed data on 818 species of plants from 18 sites into the Control Data 3600 computer in Canberra. In just 13 minutes it suggested that these 18 sites were best regarded as being of six groups, each of three sub-sites. The groupings reflected climate, prevailing moisture, soil-minerals and altitude. Later work with a bigger computer analysed 1 147 tree species from 265 sites and identified seven major vegetation regions. A classification grid was developed which enabled people with even the most limited botanical knowledge to identify rainforest types anywhere in the world, using a spot-check list of readily recognised leaf and plant structures. Numerical analyses have also provided new ideas about the reality of plant associations, and a new understanding of the factors controlling regeneration and pattern in complex rainforests. In collaboration with ecologist Jiro Kikkawa of the University of Queensland Webb extended this classification of rainforest types to fauna habitats by using bird species as ‘markers’ for other forms of wildlife. A number of rainforest areas recommended by Webb have been proclaimed National Parks by the Queensland Government. In the 1970s Webb and Tracey completed a vegetation/ecological map of Queensland’s wet tropical areas as a guide for future development. This provided evidence to help stop a proposed wood-chip industry in an area of fragile and rare rainforest. Around the same time Webb was seconded to the Papua New Guinea Government to assess the environmental implications and ecological effects of clear-felling for wood-chips in rainforests. He suggested a mosaic pattern of felling dictated by natural seed dispersal. These changes represent a loss of world heritage, of genetic resources and indeed a loss of the biological perspective for the evolution of man himself. Mangroves along the Marrdja Botanical Walk, Daintree National Park, QLD. McKay A, 1976, ‘Green cathedrals’, Surprise and Enterprise: fifty years of science for Australia, White F, Kimpton D (eds), CSIRO Publishing, pp.42-43.